Hi everyone! some of you may know me from the 96-04 area since I have a 1999 GT (click here) and a 1997 Cobra(click here). 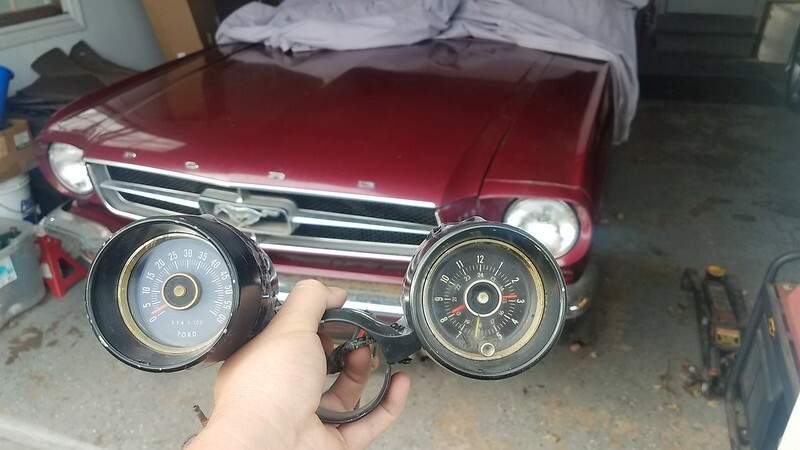 I recently picked up a 1965 Mustang that has been stored in a garage since May of 1993! Probably wondering how I picked it up so, the town i live it had and old service garage that was built in the 1930s the owner of the garage passed away a few years ago. this left his family with the garage and the contents inside of it. 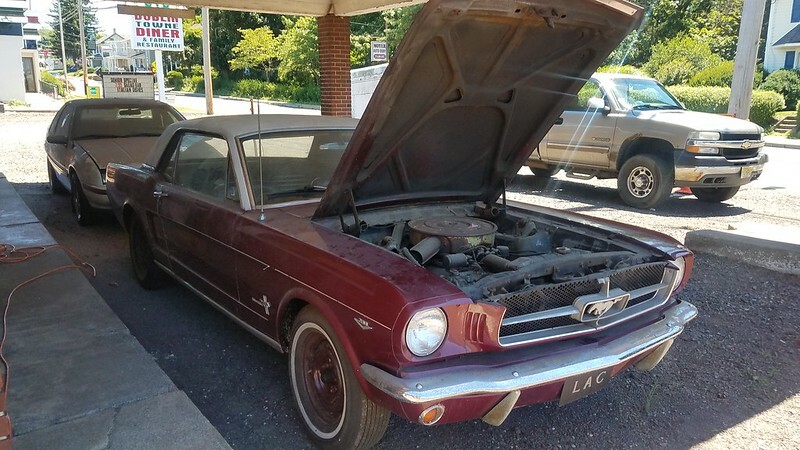 Fast forward to this past Saturday, There was a public auction held at the garage where they auctioned off nearly everything you could think an old garage would have. 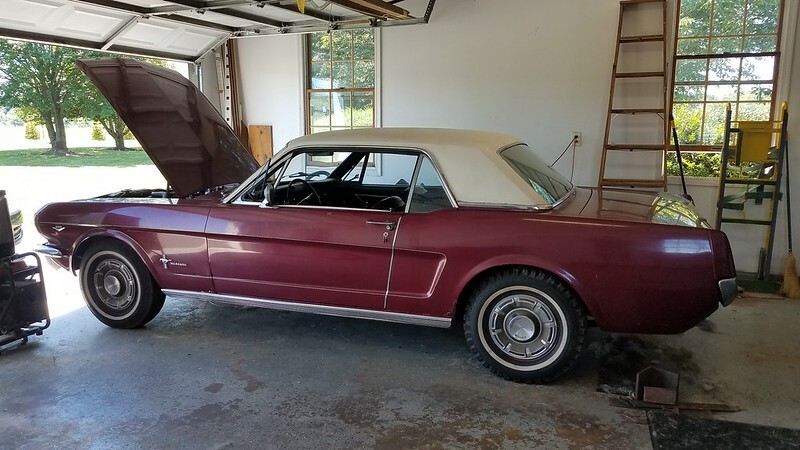 There were two classic mustangs inside, a 1968 Dark highland green coupe with a 289. 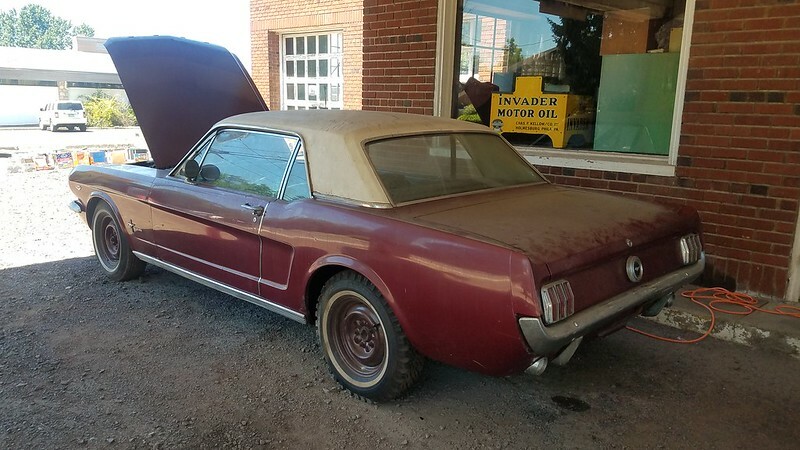 And a 1965 Mustang coupe. While I love all classic mustangs and fastbacks aside, I really like the 67/68 coupes for some reason. When the 68 went up for auction it quickly went out of my budget. 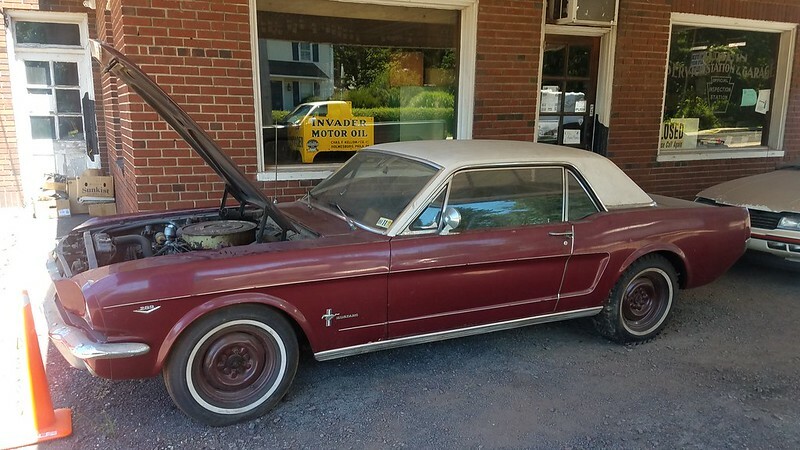 Turns out the cars original owners family was there and wanted it back for sentimental reasons and they deserved to have it. 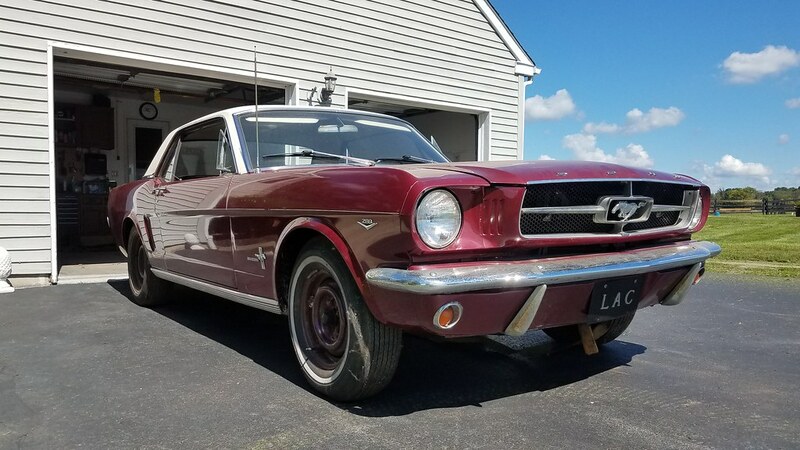 Now the 1965 is up for auction and after few people dropped out I ending up having the winning bid of $3,600! Which I think is a pretty good price for the car in its condition. It does have rust as to be expected but i've seen far worse. 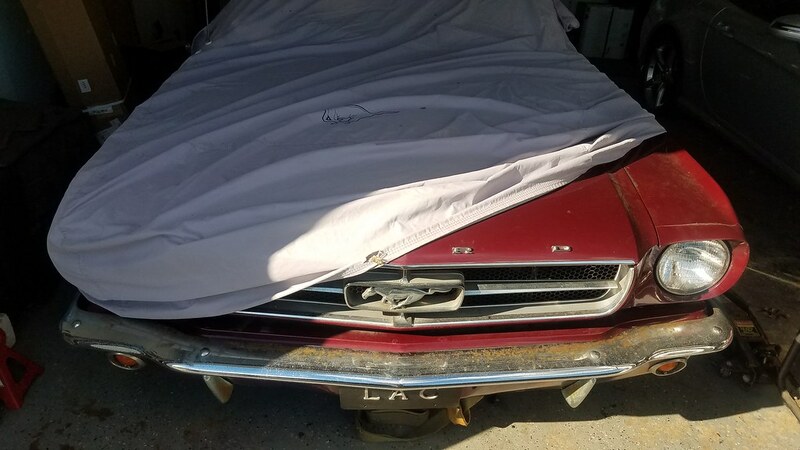 However considering the options is has, it is complete and appears to be all original and numbers matching (have to check the block #'s at a later time) I am happy with my purchase and can't wait until it's roadworthy! In the past few days of owning it i've done a few things here and there to get it closer to being roadworthy. First up was to give it a quick wash from 25 years of garage dust and dirt building up on it. After that I rolled it into the garage so it stays out of the elements. 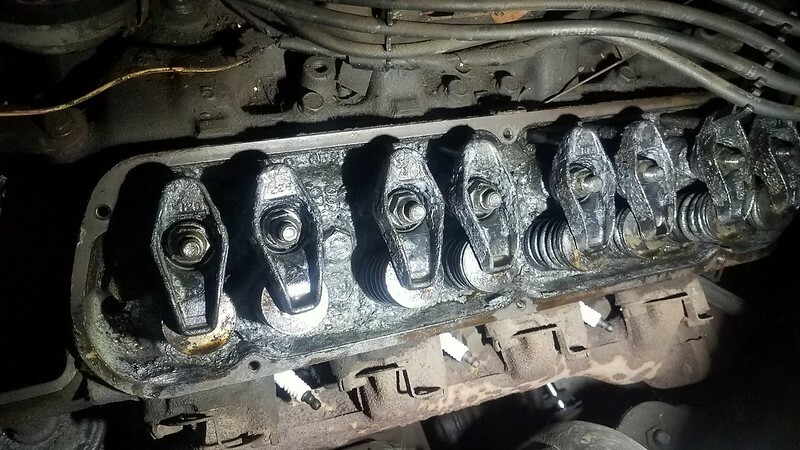 Since the car hasnt really ran since the early 90s I decided to play it safe and pull the spark plugs and spray oil in the cylinders to let it sit for a while before i tired to turn it over by hand. Luckily it turned over by hand really easily so I was super excited about that! My father and I disconnected the fuel lines, hooked a battery up and tried cranking it and it cranks with no problem! 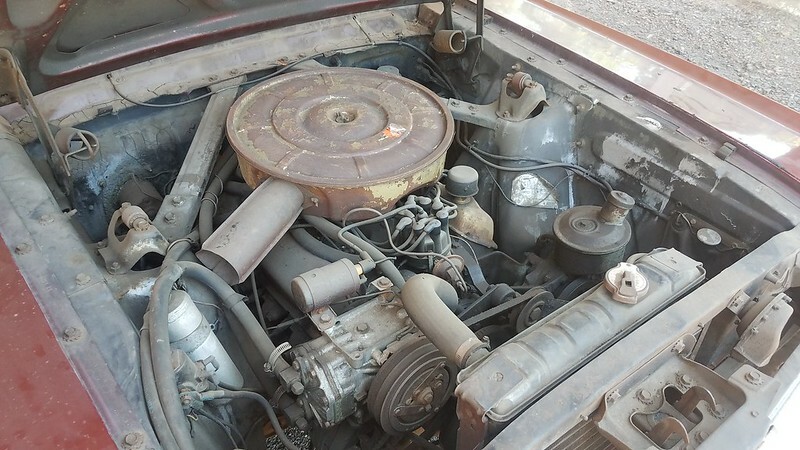 Seeing as i've never owned a car this old before, hell i've never owned anything carbureted before lol im definitely going to have questions and i'll post them in this thread. Anyways if you've read this far you probably want to see and know about the actual car lol so below are some photos of it, Let me know what you think! * I think the A/C setup is an old school aftermarket unit. Reason being is the tag on the compressor says "Eaton" and the inside vents say "Sears." I would love to know more about this as people have said it is odd that the compressor is on the passenger side? Seems like a really good deal to me. Keep us posted! Nice find! Seems to be in pretty good shape. So after a weeks worth of tinkering with it, I got it to fire up! This is the first time its ran since 1993 as far as I know. 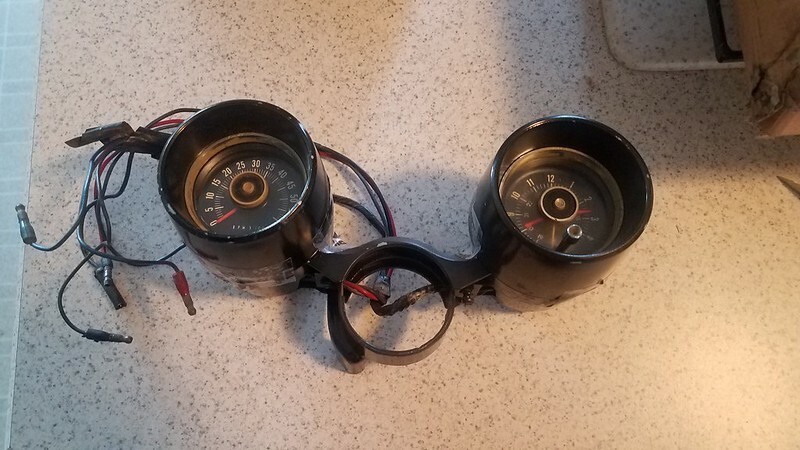 Now I did disconnect the fuel lines and rig up a temporary gas can. I did have a little bit of a lifter tap on the passenger side, however it went away after letting it run for 10-15 minutes. Been working on this here and there. Now that I know it will start and run reliably I wanted to check out the brake system. 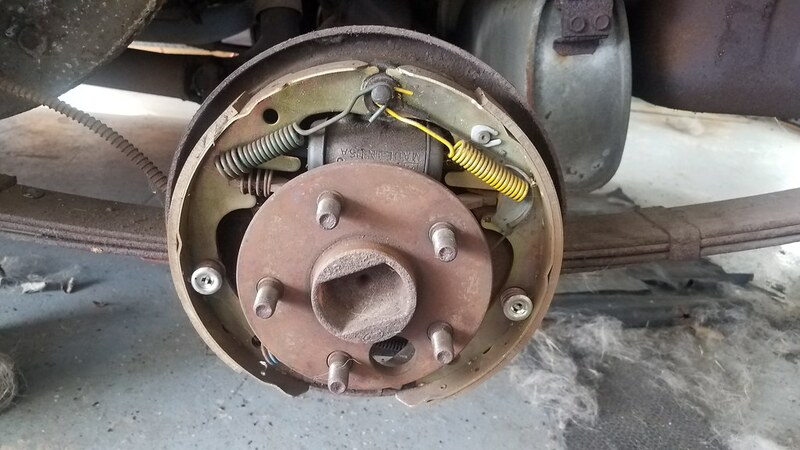 With this car having manual drum brakes all around I may opt to get a power brake booster and convert the fronts to disc brakes at a later time. But for the time being I wanted to see what i'm working with. The Fronts need all new hardware and drums. The rears however look like someone just serviced them! I will replace the wheel cylinders and drums for assurance but it was a pleasant surprise! 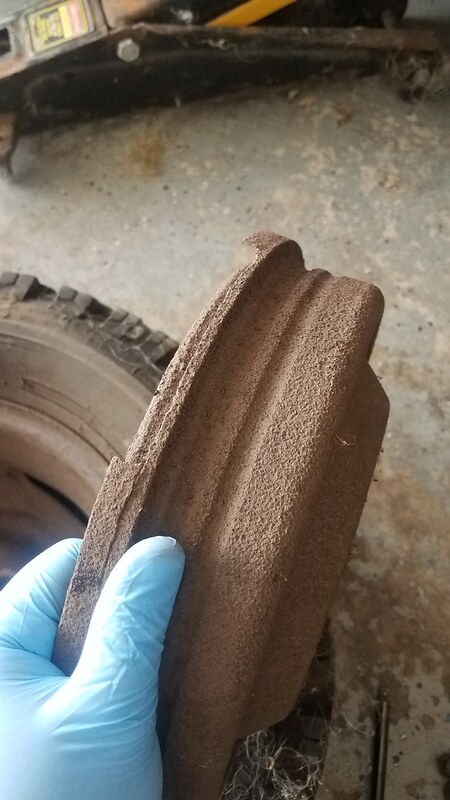 The tires on this 65 are old school bias-ply and VERY dry rotted and cracked, yet still hold air and are perfect for being rolled in and out of the garage, nothing more. However one tire, a snow tire go figure lol has a slow leak. I have a set of "starfish" wheels from my 1999 GT(245/45/17) that I figured I could throw on so I don't have to constantly add air to the tire. That idea was short lived as the wheel/tire is too wide and hits the inner wheel well. I could probably add a small spacer if I really wanted to. Was worth a shot, and I kinda like the look of 17 inch wheels on this, the size that is not the starfish wheel. That is so cool!! I am not a classic expert, but I think you did very well for the price. 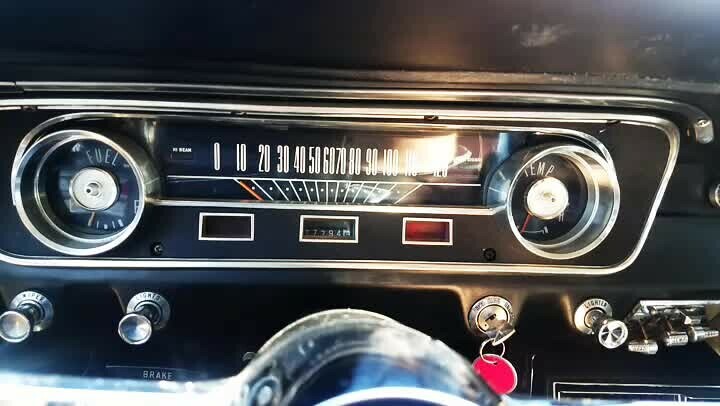 And the journey of exploring an old car like that and just figuring out the issues and tinkering sounds like fun!! The body looks solid overall in the pics (they always do though, right?) you mentioned rust... where are the rust issues at? I see the lower front rear passenger side wheel well externally. Given it has snow tires on it, that would make me worry a bit. Have you done any de-coding and/or research on the originality of the car? What options it had? What V8 it is? Looking forward to continued updates! That is so awesome!! I think you did very well for the price. and now its need 24-hour Roadside Assistance, btw this is cool hope i will see it on the road. 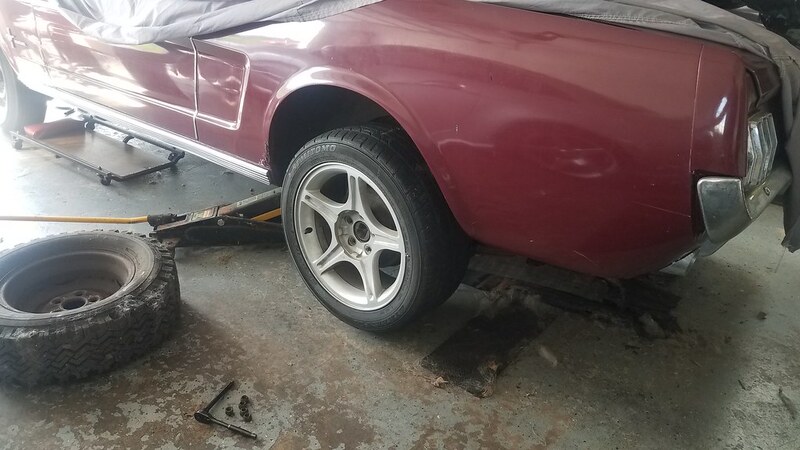 There is some rust here and there, the front part on the driver side floor needs to be fixed, and both rear quarters near the bottom of the trunk where it meets the wheel well have rust holes in them, and the bottom of the front fenders have some as well. But the bones are solid! As for options its a factory 289 2v V8, auto with power steering. 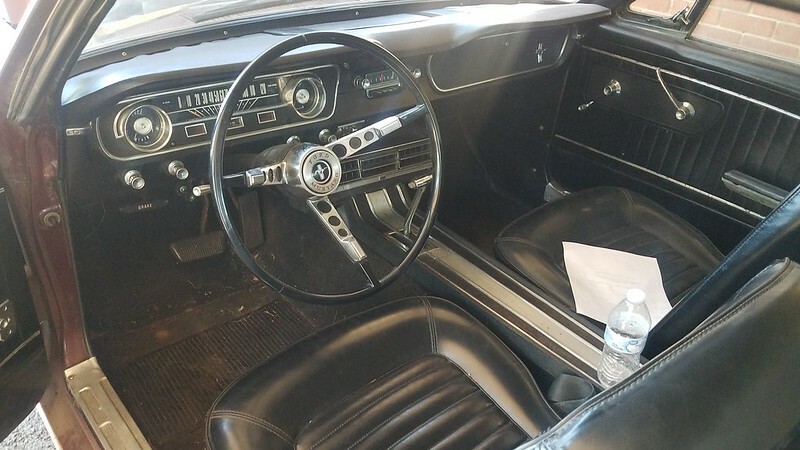 At some point someone added an AC system to the car, it has to be an old school aftermarket unit because the compressor says "Eaton" and the vents say "Sears." unfortunately i havent found much information about this unit.